The new firm is struggling for business, so Peter and Peggy resort to a cheap publicity stunt to lure a client. Meanwhile, Don's personal problems and an unflattering newspaper interview puts his and the firm's image in jeopardy. Freddy returns with a valuable new client, the firm reluctantly throws a Christmas party for its most important client, and Don prepares for his first Christmas away from his children. Don flies to Los Angeles to visit Anna before his New Year's vacation to Acapulco, but her bad news influences him to cancel his vacation and return to New York, where he discovers that Lane has problems of his own. Peter finds out that he will become a father, and has to break some bad business news to his father-in-law. Meanwhile an office focus group study for a client has some unintended personal consequences for Don. Don is forced to compete with a cocky upstart rival for a potential account with Honda motorcycles, but Roger's prejudice causes unexpected problems. Meanwhile Betty considers a psychiatrist for Sally because of her behavior. Don has a wild lost weekend after winning a CLIO award, while Peggy is forced to work all weekend in a hotel room with an "uninspired" co-worker. Meanwhile, Peter is livid after he learns that the other partners hired Ken Cosgrove. Don deliberately delays returning an important call from California, because he knows it's bad news about Anna. Instead, he keeps himself occupied by forcing Peggy to miss her birthday dinner to pull an all-nighter with him for a client. While Don's thoughts turn inward while he deals with Anna's death, Peggy is placed in a difficult situation when an obnoxious new hire in the creative department is disrespectful to Joan. Sally makes an unwelcome surprise visit to the office to see Don, Peggy tries to stop an acquaintance from publishing an article that could get her in hot water, and Roger Sterling tries to reconnect with Joan. Don becomes frightened that his lie will be exposed when government agents question Betty about him, Lane has shocking news for his father when he comes to bring him home, and Joan is forced to have an abortion. The partners try to keep their cool after they discover that Roger has lost their biggest account, Peter's wife goes into labor, and Don tries to convince Faye to compromise her ethics to drum up new business. 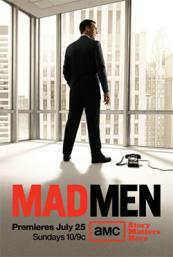 Don makes a bold, desperate move to save Sterling Cooper Draper Pryce, but the other partners are furious with his actions. Meanwhile, Sally's psychiatrist suggests that she is improving, but Betty is skeptical. Don takes the kids to California and comes back with a surprise announcement. Meanwhile, Betty fires the kids' nanny before they move out of the old house over one questionable incident, and Peggy gets a shot at a new account.